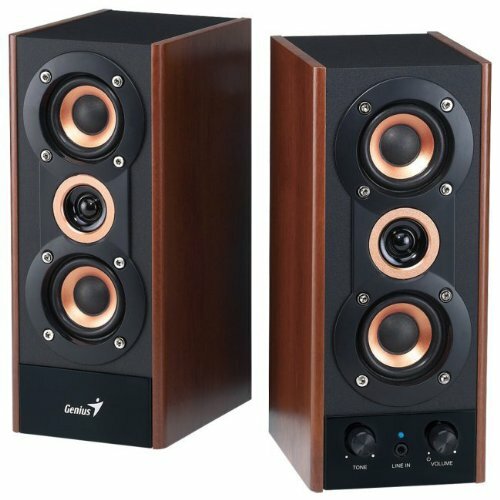 Complete your listening experience with the Genius new classic wood speaker set, SP-HF800A. The 3-way elegant design delivers clear and balanced sound. Total 20-watts output is just perfectly suitable by connecting to iPad, tablet PC, desktop or Notebook. The 2-Inch high-performance speaker units cover the full-spectrum of sound and the one-Inch tweeter gives the SP-HF800A crystal clear treble sound. Not only providing good sound, SP-HF800A is a fine boutique beside your PC with the copper-coated cones and golden-plated ring. For personal sound preference, just adjust the Tone controls. SP-HF800A also has a secondary line-In jack on the front panel for connecting to any playback device with 3.5mm jack without disconnecting the speakers from the PC. If you have any questions about this product by Genius, contact us by completing and submitting the form below. If you are looking for a specif part number, please include it with your message.